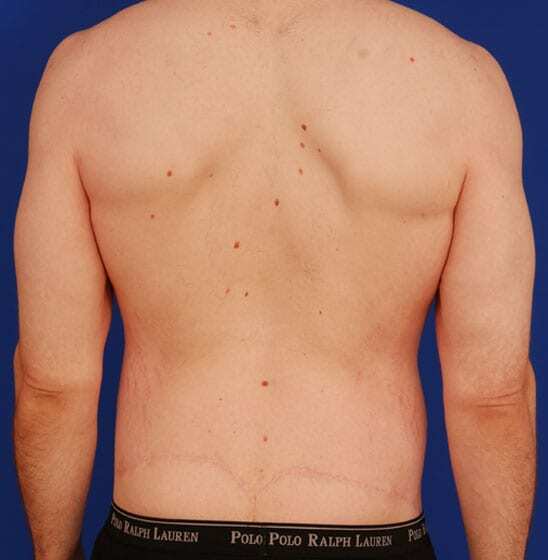 This is a 29 year old man who was interested in procedures to deal with loose skin after a large weight loss (over 180 pounds). He was in good shape physically and metabolically. He had significant laxity of the skin all over his body, but most troubling in the chest area and the abdomen. He is seen here after an excision of the skin of his chest area as well as a full abdominoplasty and a backside lift as well. The scars are across his chest area on both sides, as well as a “belt” scar around his waist. He is about one year after surgery. Because of the obesity epidemic and the number of people who have opted for bariatric surgery, there are a lot of patients who now have loose skin after weight loss. In extreme cases, those patients who are at higher risk for potential problems with surgery, I will refer them to my colleagues who perform this in the hospital setting. I offer limited services through my office in ideal candidates in terms of their weight and their health status. Many times these procedures are staged. This means, for instance, that I may do some liposuction and then a tuck or body lift. This is an “executive” decision to stage some patients for safety reasons. There is not negotiating when it comes to your health. When the skin is THAT lax, scars mean nothing. It’s the price you pay for a drastic improvement. When it comes to deciding where to start the process of removing excess skin, I tend to focus on the “big picture”. This is generally the breast area in women, and the abdomen and backside in men and women. Then comes the arms and legs usually as a secondary procedure. I feel like you went to medical school just to treat me!